BOMA meets members' changing educational needs and protects interests through legislative advocacy efforts. BOMA International offers a variety of programs designed to enhance and advance the careers of commercial real estate professionals. BOMA provides you with the industry resources and best practices you need to stay relevant, prepared and in the know. 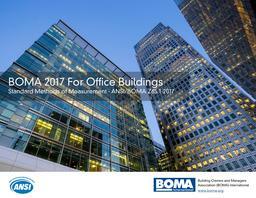 View the latest BOMA International floor measurement standards for a wide range of property types, including the 2017 Office Standard and the brand-new 2018 Gross Areas standard. Exciting jobs with excellent opportunities for career advancement in property and facility management, asset and portfolio management, leasing and brokerage, engineering, and more can be found on the BOMA Career Center. Copyright © BOMA. All rights reserved.